Here I go again, another post on the law of attraction... But hear me out. Everyone's heard about the concept of visualisation, but many people don't quite understand the full process or how effective it can really be. In my law of attraction blog post I described how many things that I "dreamt" of in the past actually manifested themselves into my life. And it's no surprise that these are the things which I'd think about over and over again. Putting it simply, visualisation is a method of clarifying what you want, and shifting your energy to believe that you can attain it, if you decide to put in the work, obviously. I got the inspiration for this post after watching fitness entrepreneur, Ashanti Johnson, present a TED Talk on "The Power of Visualisation". In this talk she shared her story on how she took action on her vision despite whether or not she got validation from her "family, bank account or landlord." Obviously this was a huge risk and she wasn't ashamed to hide the fact of how she did struggle. But the main message was how she never gave up and continued to maintain her positive attitude because she had faith in herself and her vision. Low and behold, she manifested everything she set out to achieve. When people hear about the law of attraction, many jump onto the idea that it is a method of "wishing" for what you want and it magically coming to life. This is not the case. The law of attraction is merely a motivational technique which proves that if you put the effort in, anything can be achieved, and visualisation is a method which makes your goals easier to attain. 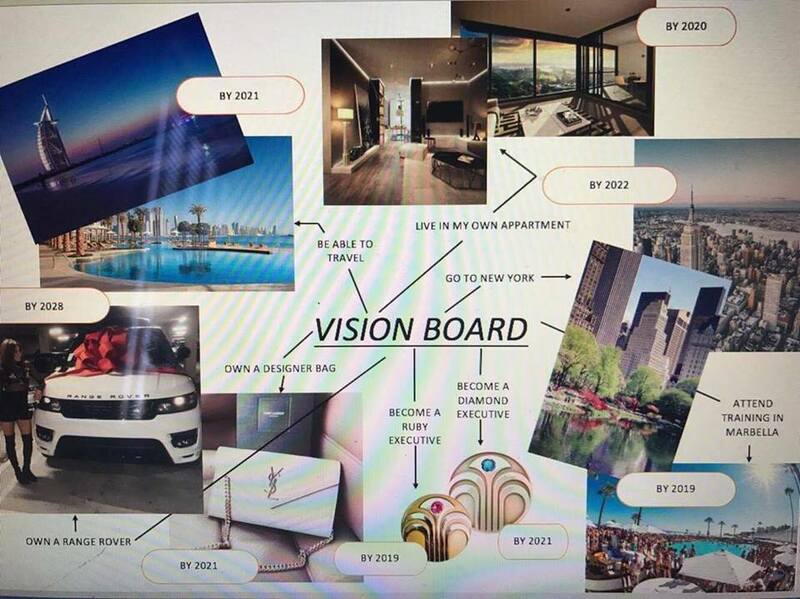 Vision boards are a tool that I have been using for over 2 years now. As I'm writing this post in my university bedroom, I have my current goal board stuck on the wall in front of me, some goals already ticked off and achieved. Duh, this is the main visualisation technique of the whole process. During her talk, Ashanti described that visual imagery allows you to clarify what you want. You may already know what goals you want to achieve, but they may be clouded by other mental clutter going on in your mind. Visually displaying what you want to achieve will allow you to exercise your visualisation muscle and will allow your goals to seem more real and attainable. Seeing everything you want to achieve laid out in front of you can be quite overwhelming. You wont know where to start or even how to start working towards them. Placing time frames on your goals will allow you to prioritise what to work on first, and what is most important to you. Be honest when creating these time frames- you may want some of your visions to manifest instantly, but in reality it might take years of work before it's achieved. On my vision boards I write down the year I want to achieve my goals by, this makes them seem more manageable and helps me stay on track. 3. It's okay to change what you want. The image at the start of this post is of one of my very first goal boards. I now have a completely different one with different goals as I have developed as a person and changed what I want in life. This is completely normal and okay. Don't think that once you have created a goal board that it is final and you must complete everything on it. Adapt it as you go adding more goals or removing goals that no longer serve you. Be as specific as you can with your goals. As you can see in my old goal board I wasn't that specific in the areas of "be able to travel" and "own a range rover" - Where do I want to be able to travel to? How many times a year do I want to be able to travel? What model of Range Rover do I want to own? What brand of designer bag do I want to be my first purchase? (Spoiler alert, it was a YSL). Making sure your goals aren't too vague allows you to really focus and visualise on just exactly what it is you want. Have you ever created a goal board? Watch Ashanti's Ted Talk here. I love having vision boards, they keep me going! I do love your content and I’m super excited to invite you to join the exclusive Bloggsy team.